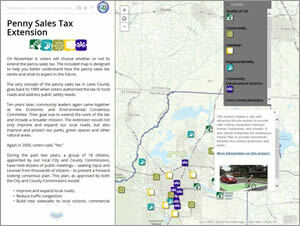 You can click on an icon in the Story Map Journal app to learn more about a project funded by the penny sales tax. Leon County, Florida, voters faced a weighty decision: Vote yes to extend a one-cent local government infrastructure sales tax for 20 years or vote no and stop shelling out the extra penny. County staffers felt that such an important referendum demanded lively, engaging educational materials for the public to review before the vote earlier this month. 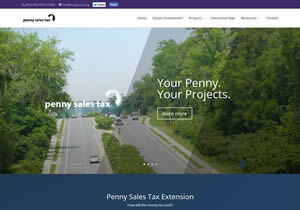 So when they rolled out the visually appealing and user-friendly website leonpenny.org in August, an interactive Esri Story Map Journal App called Penny Sales Tax Extension was one of the main features. Esri's Story Map Journal app uses a mix of media—maps; narrative text; video; images; pop-ups; and, in some cases, music—to tell a story. Though popular for topics such as history, political upheaval, travel, and conservation, the team from Leon County decided the mapping app at leonpenny.org was a perfect fit for answering the taxing question: How will the money be used? "The map tells an engaging story," said Vincent S. Long, Leon County administrator. "We wanted a way to communicate not only the nuts and bolts of each penny sales tax project but also the story of how this extension would shape our community for generations to come." Leonpenny.org serves as the gateway to the interactive map. The mapping app's left panel displays text and images that summarize and illustrate 29 infrastructure improvement and economic development projects in Leon County that would be paid for with the penny tax. These include street and sidewalk improvements, new bike lanes, revamped bus stops, county fairgrounds beautification, and added park and green space. 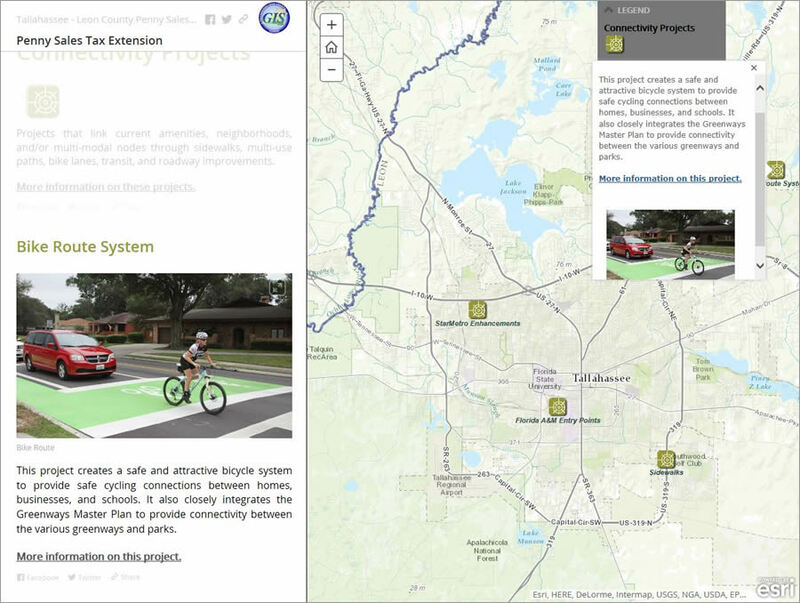 As you are scrolling down to each new section (e.g., Connectivity Projects), a map on the right displays icons that show the general location of each individual project (e.g., Bike Route System). Clicking the icon brings up a pop-up with a short description of the project and a related image (such as a photo or artist's rendering). 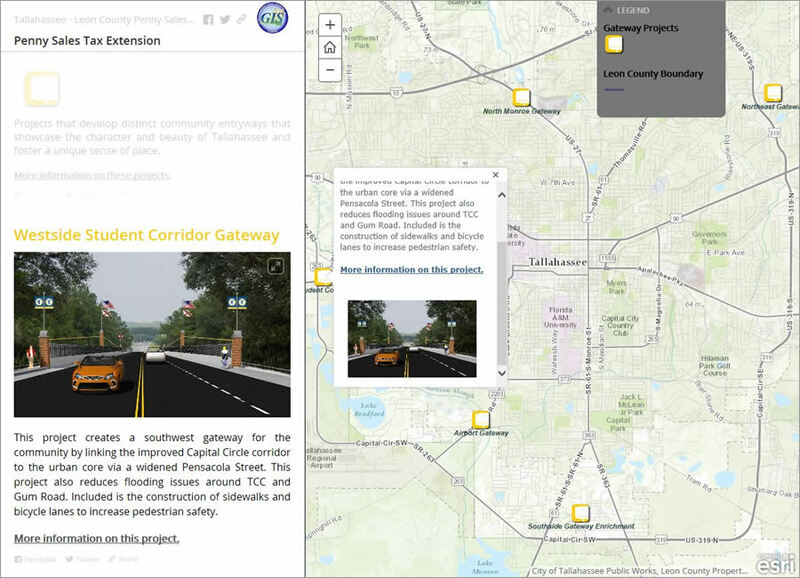 In both the story and the map, you can click a link to obtain estimated project costs, a PDF with a more detailed map, and a form to fill out to connect with Leon County staff. 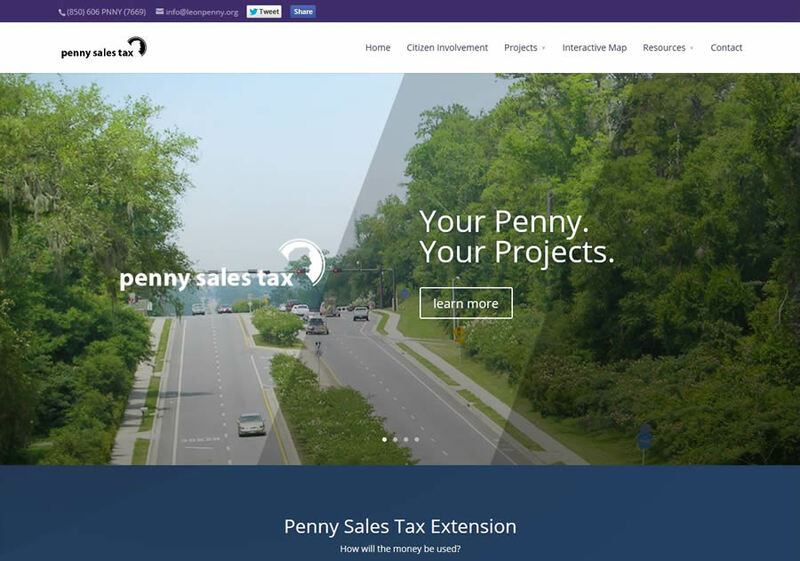 Cristina Paredes, the county's intergovernmental affairs and special projects coordinator, said voters are fans of leonpenny.org and the interactive map, whether or not they support the penny tax. "They say, This website is user-friendly and we love the interactive map [and] being able to visualize where the projects are located," she said. The interactive map, which has garnered more than 2,900 views so far, also is a more compelling way to present information than a printed document alone, such as a PDF, according to Paredes. "We just didn't want to hand people a booklet," Paredes said. "We wanted people to interact [with] and visualize it." Mathieu Cavell, the county's public information specialist, said Leon County thinks outside the box to get people engaged in civic affairs. "Old, stale government reports are not the way to relate to people," he said, adding that the app is appealing, accessible, and "pretty fun." As you scroll through different sections of the Story Map Journal app, a description about each penny sales tax project appears. The Story Map app also emphasizes the geographic diversity of the projects in 702-square-mile Leon County. Each icon on the map represents a project, and with the icons spread across a wide area, people can see how everyone benefits, Paredes said. Creating the interactive map was a collaborative effort by Tallahassee-Leon County GIS; Community and Media Relations; and DesignWorks, the Leon County Planning Department's urban design team. GIS systems integration specialist Ned Cake said the original plan was to display the projects using Esri's Story Map Tour app or a custom version of a Story Map app with tabs. However, when Leon County GIS manager Scott Weisman saw Esri president Jack Dangermond introduce the Story Map Journal app at the 2014 Esri User Conference, Weisman was sold. He quickly sent a text message to Cake back at the office in Florida. "'Check this [app] out. It's a game changer,'" Cake recalls Weisman saying. Cake used Leon County's ArcGIS Online organization to launch the Map Journal Builder and create a skeleton app. He loaded the Esri World Topographic basemap into the app, along with narrative text and photos and other images provided by Cavell's office. Cake created a web map with editable features. Community and Media Relations then populated the points on the map. "I worked with an intern to develop the pop-ups," added Cake. Colorful icons and photographs populate Leon County's Story Map Journal app. DesignWorks created colorful custom icons for the map, which matched the colors of the section headlines in the narrative panel. It's almost a work of art. "We love it," Cavell said. Not only was the app created and launched using ArcGIS Online, but it runs on ArcGIS Online, too. It's a 100-percent cloud solution, Cake said. "We wanted to impress upon the viewer that a lot of thought and energy went into each infrastructure or economic development project," Cavell said. "The Story Map application represented the perfect blend of narrative and analytics."